To identify and seize potential opportunities, in addition to recognizing and neutralizing threats, enterprises need a real-time analytics platform that can turn relentless streams of data into meaningful and actionable insights. When captured in the right context, data streams can help identify events that enterprises can analyze to tap hidden value from numerous sources such as financial ...markets, mobile devices, Internet of Things (IoT) sensors, clickstreams, and business transactions. 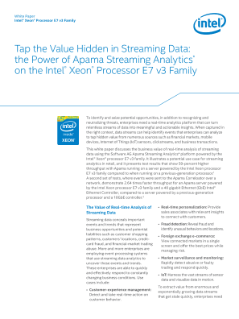 This white paper discusses the business value of real-time analysis of streaming data using the Software AG Apama Streaming Analytics* platform powered by the Intel® Xeon® processor E7 v3 family. It illustrates a potential use case for streaming analytics in retail, and it presents test results that show higher throughput with Apama running on a server powered by the Intel® Xeon® processor E7 v3 family compared to when running on a previous-generation processor.